TrafficSwarm and LinkReferral are two of the best amongst the dozens of traffic exchanges websites. The basic premise of all of them is the same: You sign up for a free account, register your blog or website link, and in exchange for clicking on the links of other members’ they will click on yours. It is there, though, that the similarities end. 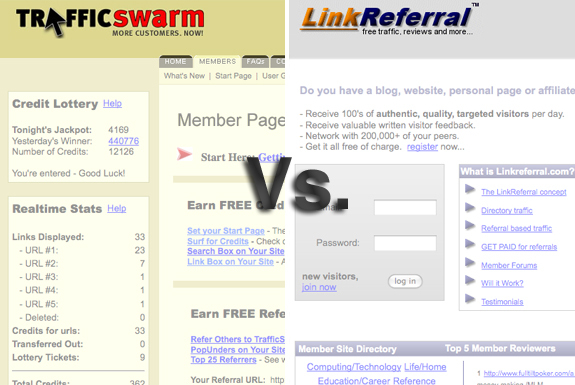 Which service is better, TrafficSwarm or Link Referral? Read on . . .
To get people on a traffic exchange service to click to your website you have click to other members’ sites. Either that or pay money. TrafficSwarm works through a series of credits—every visit you make to a member site earns you a random number of credits, usually between 1 and 5 but sometimes 0 or 50 or more. The randomness of it gives TrafficSwarm a bit of a casino feel. Indeed, you can use your credits there to buy entries in a daily credit lottery. Clicks to TrafficSwarm members are made within a frame in a separate window (the “Start Page”) where there’s a 20 second timer. You have you remain on the member site you visit for the full 20 seconds, and then click “next” to get your credits. Credits can also be purchased; the cost per thousand credits ranges from $20 (for 2,000 credits) to $9 (for 50,000). On LinkReferral your website is listed in a particular subject category and subcategory (eg. shopping and clothing). Your activity on the LinkReferal website will earn you a higher listing on the category and subcategory pages. As people click on your site you’ll be moved down in the listings. Being active on the LinkReferal site includes writing reviews of members’ websites, adding a member to your favorites list and participating in the LinkReferral forums as well as clicking on member’s websites. Unlike TrafficSwarm, there’s no timer that requires you to stay on the sites you link to for a specific length of time; you can open your click into a new tab or window if you like. If all that sounds like too much work you can buy yourself a spot amongst the top 10 listings for $35/month. TrafficSwarm is a little like a free AdWords program. You set up a campaign, write a short description of your link, and decide how many credits per day to devote to a particular campaign. (You can have multiple campaigns in one account). Every time your link is displayed it costs you one credit. Links are displayed on the Start Page eight at a time. So, all else being equal, you can figure that a single click will cost you eight credits. On LinkReferral, there’s no theoretical limit to how much traffic you can get. Users of the site click to a particular category and subcategory and if they like the look of the link they’ll click to your site. Which site will get you the most traffic? If you are active enough to get among the top 30 sites in any category, then LinkReferral will get you a fair bit more traffic than TrafficSwarm. Exactly how much time is required to get into the top 30 depends on what category your site is in. If you have a website touting some sort of money making scheme then you’ll have to return to the LinkReferral website a few times a week each time maxing out your activity allotment (30 clicks, 5 website reviews, 1 new favorite and 1 forum posting per day). If you have a website in a less popular niche (health products or a personal blog, for example) then you can stay high on the list with relatively minimal effort. For a typical website, if you spend a hour per week on one of these sites then you can expect about 10 to 40 visits in that time through TrafficSwarm compared to 30 to 200 visits through LinkReferral. Which site will get you the highest quality traffic? If you have an online store and hope to use either LinkReferral or TrafficSwarm to directly drive your online sales then the answer is: neither. Users of both services are visiting your site so that more people will visit theirs—the majority of them aren’t looking to buy anything. If you have a site that deals with website development or online advertising issues you’ll get high quality traffic through both services. The one thing the all the users of both services have in common: They are all taking time to get more traffic to their own sites. If your goal is to simply get people to read your content then you’ll get traffic that will be of average quality through both services.
. . . LinkReferral. Though which service you should choose does depend somewhat on your specific circumstances. If your website is an online store or touts a money making opportunity then it will be too tough for you to consistently keep a high listing on LinkReferral using their free service. In this case you’d be better off with TrafficSwarm. You’ll also appreciate TrafficSwarm if you have four or more links you want to promote, since every link you want to list on LinkReferral requires opening a new account. Except for those cases, though, the clear choice is LinkReferral—it will very likely bring you more traffic for less effort compared to TrafficSwarm. LinkReferral is also the better deal (by a large margin!) if you are thinking of buying traffic regardless of which sort of website you are looking to promote. The $35/month for top place in LinkReferral is one of the web’s best deals for getting quality traffic to your site. The $50 fee for a lifetime premium status with LinkReferral is also a good deal. If you aren’t going to pay for special treatment or extra credits keep in mind that both TrafficSwarm and LinkReferral will require you to be active on their sites, at least occasionally, for you to see any benefit from them. The good news is: If you have an upstart website either, or both, of these services will help you get traffic. I used link referel,it is a very good technique to get traffic,Link referel giving you an opportunity to review other sites, that is great. excellent article, good work. I feel both are good choices choice for making traffic. Interesting post, I also think linkreferral is better than trafficswarm. I using linkreferral for a couple of month and i have to say it works very good, Trafficswarm i didnt use yet. I like LinkReferral a lot, it is a great source of traffic, much better then any other alternative. Thank you for the review. I was thinking whether to go with LinkReferral or not. And I joined after reading your article and hopefully will see some impact to the traffic of my site. I own a free traffic exchange and i have been using traffic swarm to promote it for quite sometime. I get good results from trafficswarm as far as getting members to my traffic exchange. I have not used linkreferral yet but am on my way to check it out now. Thank you for this review. Linkreferral is better. Free link service but you have to surf to get results for credits and a lot of work. Unless you subcribe to the packages available, which i think is a bit too expensive. But paid membership receives tons of visitors. 20% of my traffic comes from linkreferral; considered good enuf. I have just joined link referral using the free service. i find it does boast my traffic and hopefully is giving my site more publicity! Downside is that I have to open another account for my other sites. Thanks for the article. Currently i am using linkreferral. Joined for foe 4 months already and i thinks the results are great! But think again, its is mostly for visitors like myself; at least to be honest. What i mean is that most of the visitors don’t actualy read the blog or website content itself. They would probably click on ur site just to get credits. But what we need here is a “come-back” visitors who would and up becoming your fan. But hey, who cares? It is one of the good way to promote our site or blog. And yes, there are still the best among them, and worst among them too(sites)! Well guys, think again, most of the vivitors will end up like me and you. Like we are competing one against the other! How would you rate Entrecard vs TrafficSwarm and LinkReferral? My experience with Entrecard was quite successful in terms of traffic drive…but bounce rate was high. I once gave traffic exchange network a try. I remember it was some thing like blog soldiers. The traffic I got was not targeted so I left then and never joined any traffic exchange network. Not a big fan of such networks ! Good article, luckily I signed up for Linkreferral beforehand and I must say I agree completely. It seems like much more traffic for less work. This is a very informative article. I’m new to the concept of traffic exchange websites and frankly, was researching LinkReferral to find out if it was a scam, so this is very useful inforamation for me. thanks for the review man as u said its not targeted traffic and peoples jus visit others site to reach the 30 sites per day.have been on link referral for a day now.. will try trafficswarm.. Thanks for the article. I’ll give Linkreerral a try. is best and easiest to just trade links and comments on blogs and forums like this to get FREE traffic. If time is $$ then this aint FREE nor is Linkreferral,Entrecard,Blogupp,Esyhits4u,Traffic Swarm,Blogcatalog and sites like it that ask for money also to get the credit for bringing them referrals when people pay to join. You really can advertise for FREE if You are smart and know how. Ann Reilly’s last blog post..LIVE form the red carpet..
What a dummy I am! I joined both and find Link Referral very beneficial. But I was wondering why Traffic Swarm never sends me any traffic, although I have almost a thousand in credits (958 to be exact). Now the mystery is solved! I did everything except decide “how many credits per day to devote to a particular campaign.” Thanks very much for this article… now I feel like a real donkey, LOL. Very informative article. The Internet traffic game is a new experience to me. What little I have read, I know I need to become more knowledgeable in this field if I am going to make it in online marketing. I believe this article gave a fair review of both businesses. I just recently joined Link Referral and excited about what may come about. I joined to get the exposure and to educate my self in the market. This article has explained in detail the proses and cons of both programs. I hope in the future i will be able to build my business to the point where I can afford to pay $35 a month to pull more traffic my way. Now I know where to go! Sandy Davison’s last blog post..What Saith You? Very interesting article. I recently joined LinkReferral and have gotten a little traffic so far. I’ve actually never heard of Traffic Swarm. I’m glad you ultimately picked the one I signed up for. Yes LR is much better pick if you ask me. I’ve been a member in both of these companies for years. Getting traffic to my free online training site. very informative review, i was about to signup for trafficswarm but opted for linkreferral instead. thanks alot.. I am currently using LinkReferral at the moment and I must say it is not bad at all. I think I will try trafficswarm in the future as well.